When we are told that an item is made of gold, we expect it to be very beautiful and expensive. Gold symbolizes the ultimate in luxury and success. However, not all golds are alike. Some pieces may only be half gold and if you’re looking for totally pure gold, it actually doesn’t exist. What you’re going to find are pieces made of 10k gold, 14k gold, or 18k gold content. 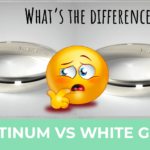 It’s important to know exactly what you’re getting for your money in terms of purity when you set out to buy a yellow gold engagement ring, for example. It would be embarrassing to flaunt what you think is a 24k-gold ring when it’s actually just 10 karat gold. 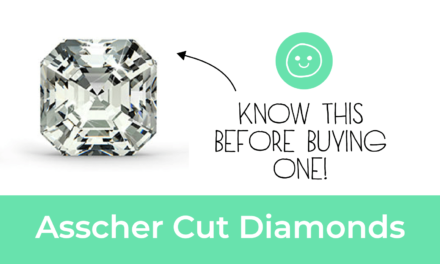 Don’t be fooled by a dishonest jeweler. 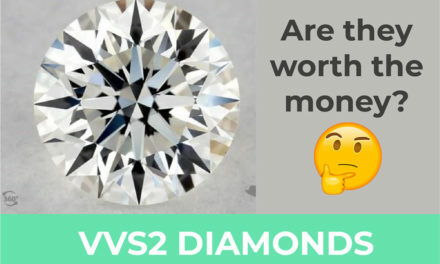 What can also be confusing when buying jewelry is that “karats” indicates the level of purity in gold, whereas “carats” indicates the weight of a diamond. 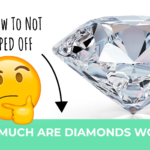 In this article we are going to discuss karats and the distinctions between 10k, 14k and 18k gold, along with the pros and cons of each…which might end up saving you money! An item made of pure gold would be 24 karat gold. A ring made of 18k gold would actually be 75% gold and it might be inscribed with the number 750 on it somewhere. The other 25% would be made up of various metal alloys that provide additional hardness. 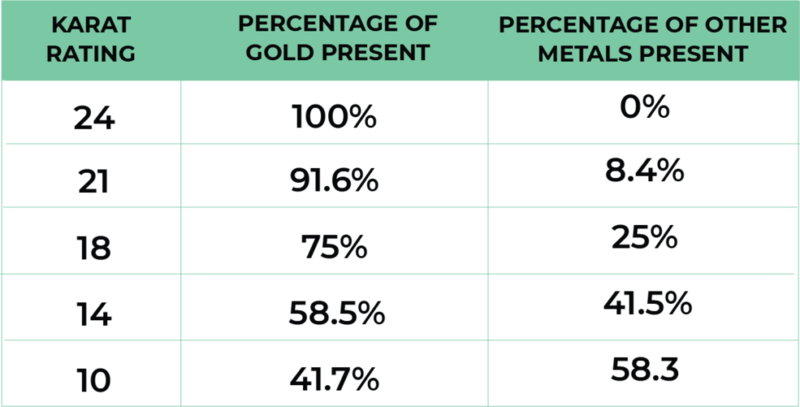 The chart below shows the percentages of gold contained in the various karat grades. Although gold jewelry is made with various amounts of gold, the most common are 10k, 14k and 18k. It would be nearly impossible to find a ring made of pure gold. That’s because pure gold is a soft metal and wouldn’t hold its shape. It would bend and scratch way too easily. Therefore, it would make no sense to use this level of purity when making gold wedding or engagement rings that one would be worn constantly. The truth is that you would start noticing scrapes and scratches in a 24-karat gold ring almost immediately and before long it would start losing its shape. Jewelers purposely add a number of metal alloys to gold to increase its hardness and durability, especially when making rings. A yellow gold ring is usually mixed with nickel, palladium, platinum and/or silver so the ring will be sturdier. There have been rings made of pure gold, but for ceremonial use only. Since they are only worn on very rare occasions, their lack of hardness and durability doesn’t become an issue. While it’s rare to find 24-k gold rings, you can find earrings made of 24k gold since they don’t encounter much wear and tear. A piece of 24k yellow gold will be more intensely gold in color, but when you’re just visually comparing 10k vs. 14k vs. 18k gold you can hardly distinguish any difference. The main feature of 10k gold is that it is actually made up of less gold than of alloy metals, containing only 41.7% pure gold mixed with 58.3% alloy. Because of this, an item made of 10k gold is less expensive than one made of 14k gold. In fact, 10k gold is often referred to as “discount gold.” This is why many top-rated jewelers don’t offer pieces made of 10k gold. When you compare 10k vs. 14k gold you will see that 10k gold appears a bit paler in color than 14k gold, but it’s hard to see the distinction with the naked eye. It also tends to tarnish faster than 14k or 18k gold, but if you polish it frequently it really isn’t a problem. I’m not saying that you should not buy something in 10k gold! The truth is that 10k gold offers good value for your hard-earned money! In fact, you will find that an item made of 10k gold is a lot more durable than something made of 14k gold. Overall, 10k gold jewelry is a smart choice for those in search of a bargain! 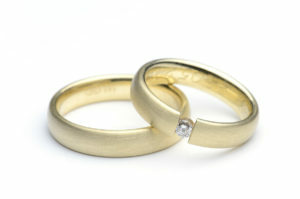 When it comes to wedding and engagement rings, ones made of 14k gold are the most popular. In fact, nearly 90% of those sold in the U.S. are 14k gold. Why is this? The reason is that a 14k gold ring is 58.5% gold, which means it will not tarnish very easily and is durable enough to hold its shape and withstand being easily scratched. 14k yellow gold is also a nice vivid color that is hard to distinguish from 18k gold, yet comes at a much lower price point. Furthermore, 14k gold is far more durable than 18k gold, which means 14k gold jewelry will be free of visible marks and scratches than an 18k gold piece. 14k gold offers the perfect balance in terms of appearance, durability and price. An item made of 18k gold contains 75% gold and is one of the most popular among gold metals because it contains the highest level of gold. 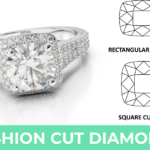 High-end jewelry is often made of 18k gold, especially diamond wedding and engagement rings. Clearly, 18k gold is going to be the most expensive, but it certainly is beautiful and will tarnish less than jewelry made of 10k or 14k gold. However, the disadvantage is that 18k gold, being softer, will scratch more easily and show signs of wear and tear. The truth is that a ring made of 18k gold is going to need more tender loving care than a ring made of 14k gold. However, they will appear nearly identical. So the question is, are you going to pay more for an 18k gold ring when the only obvious difference is that it will require more care? If you don’t mind paying for luxury then an 18k gold ring would be your best choice, knowing that this ring contains the most amount of gold while being sufficiently durable. It goes without saying that preferring 18k gold over 14k gold is mostly about knowing that it contains more gold, which makes it more luxurious. 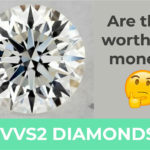 If you do not have much experience shopping for diamond and gold jewelry, you might think a well-known jewelry store would be your safest option. 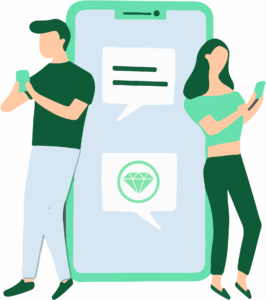 Traditional jewelry stores give the impression that their jewelers are the most knowledgeable and that their rings are set with the most beautiful diamonds in the world. 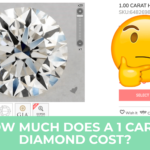 This is why many people are hesitant to shop for jewelry online. But, the world has changed. You can very easily purchase diamond and gold engagement rings online these days. You can find the most beautiful selection of diamond and yellow gold engagement rings that match your skin tone on sites such as James Allen. They offer a much wider selection than you can find almost anywhere else and at much lower prices. 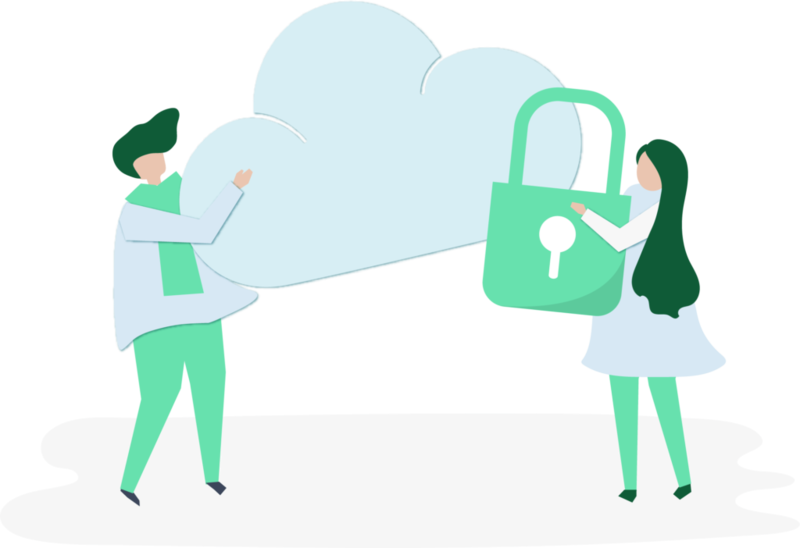 By not being burdened with the cost of maintaining a storefront, online vendors can pass those savings onto our customers. 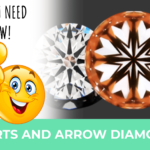 On Sites such as James Allen you will find a huge selection of diamond ring sets in 10-karat, 14-karat gold yellow gold and 18 karat yellow gold in many different styles. Of course you can also find ring settings in white metal or white gold or rose gold and platinum with rhodium plating. 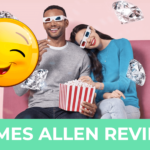 If you are concerned about the quality of diamonds, James Allen allows you to view 360° videos of their diamonds in high definition and up to 40-times magnification so you can see the level of clarity and any inclusions. 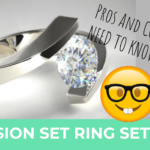 Selecting the perfect gold engagement ring doesn’t mean that it has to be 18k yellow gold. Your options include 10k and 14k yellow gold as well as white gold and rose gold. 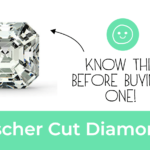 It is always best to consider all your options while keeping your budget in mind when making any jewelry purchase. 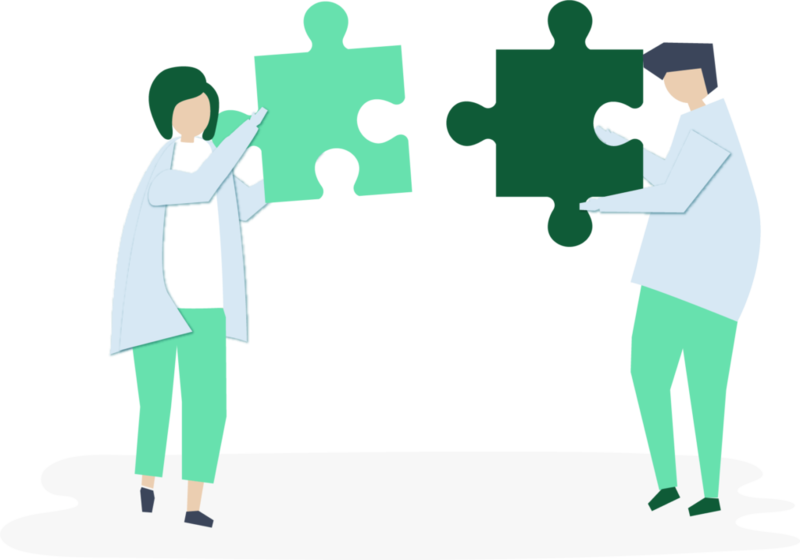 But, there is no doubt that you can get the most for your money if you shop at reputable online stores such as James Allen. Thanks for the great summary and info graphic! 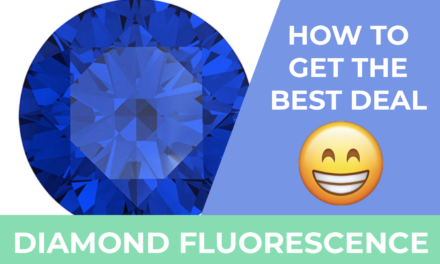 Diamond Fluorescence Good or Bad? 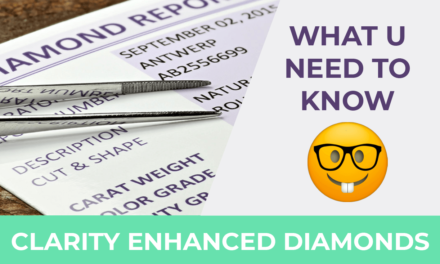 Are Clarity Enhanced Diamonds a Good Natural Diamond Alternative?